Based on his impressive play during his career, Calvin Johnson has put himself in a rare group of football players. Not simply one of the best wide receivers in the current era of football, Megatron is approaching the discussion of the best wide receivers in NFL history. Although injuries and declining skills have slowed his ascent, he still might one day stand alongside the greatest receivers of all-time and holds many receiving records. With his career is coming to a close, Calvin Johnson cards remain on the collecting radar. Shop for Calvin Johnson autographed cards on eBay. Although he started in the NFL in 2007, Calvin Johnson did not get as much early publicity because he was one of the few bright spots on some terrible Detroit Lions' teams, including the 0-16 team of 2008. With more talented players in the fold, Johnson took his game to another level. In 2012, Calvin Johnson set the NFL record for most receiving yards in a season, with 1,964 yards. He also holds the record for most consecutive 100-yard games at eight. 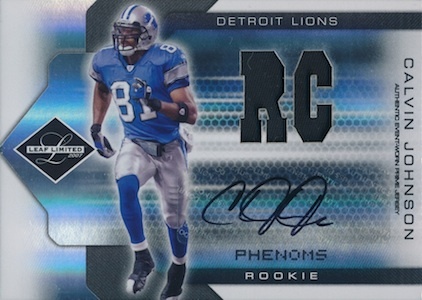 The earliest Calvin Johnson cards were issued in 2007 and these rookies remain his key cards for most collectors. While the total options are quite plentiful, his signed cards typically garner the most attention. 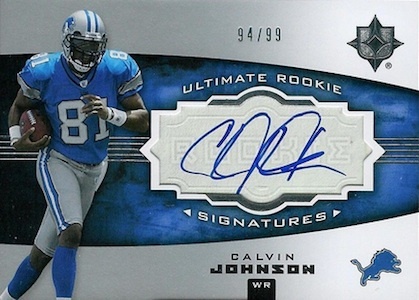 The following list documents the top ten Calvin Johnson rookie cards available to collectors. All feature autographs and limited print runs. Although they are all found with relative ease, prices can push fairly high for the very top choices. SPx is known for its loud designs and 2007 was no different. An X-shaped layout splits the card into four, with a refractor finish. 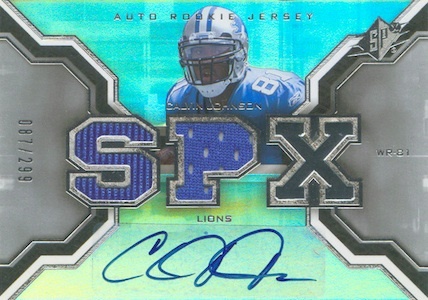 The SPx die-cut jersey logo does dominate the card and tends to overshadow the sticker autograph below. 2007 SP Chirography was a short-lived brand from Upper Deck, but it remains relevant due to the 2007 rookie class that included Calvin Johnson and Adrian Peterson. While the card itself is nothing special, and the background just appears to be heavy clouds, a low print run of 149 and sticker autograph helps keep it relevant. 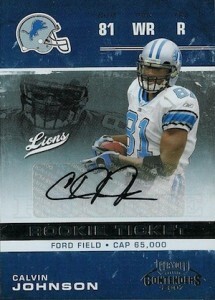 2007 Limited contains another Calvin Johnson rookie card that offers good value. Including a jersey piece, sticker autograph and print run of 99, it matches up with most of the top cards on this list. Despite this, it can generally be found for more reasonable amounts. Basically a more-subtle version of the Triple Threads card, the inaugural 2007 Upper Deck Premier Football tones down the color and doubles the print run. While the sticker autograph does not stand out in a negative way, the large single-color jersey piece is a bit of a letdown. The Upper Deck Premier Football brand did not last long in the hobby, and only saw one more release in 2008 before it was scrapped. 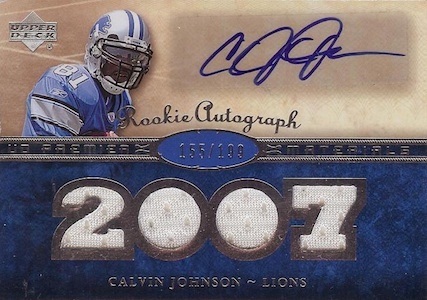 Like a slap in the face, the 2007 Topps Triple Threads rookie card for Calvin Johnson makes its presence known. A foil sticker autograph is centered amongst a vivid red background, with a trio of patch pieces below. It may not win style points, but the print run of 99 keeps it popular with collectors. On paper, this card may not seem as worthy as other Clavin Johnson rookie cards to be featured on list list. However, Playoff Contenders has established itself as popular option for rookie collectors based on its short-printed autographs. Even though the announced print run of 525 is on the high side and the card includes a sticker autograph, values remain strong for this top rookie card. 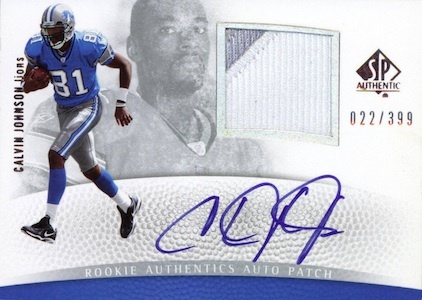 Calvin Johnson's 2007 SP Authentic rookie card may have one of the highest print runs of the group, but it makes up for that with a great design and on-card autograph. It also adds a small jersey piece, offering one of the better overall Calvin Johnson rookie card values and slightly easier to track down. It may not feature a jersey piece like many of the other cards on this list, but the 2007 Ultimate Collection rookie card for Calvin Johnson really works. The vivid blue pops off the card and the silver foil signing area does a great job showcasing the signature. While it is not technically on-card, which may disappoint some collectors, the trapped cut signature is well-incorporated into the design. National Treasures has proven to be a worthy competitor to Exquisite Collection. Depending on individual preferences, the layout for Calvin Johnson's National treasures rookie card might be a better card due to the clean design. In any case, the card is a close second to Exquisite rookie as it matches up in every category except hobby clout. 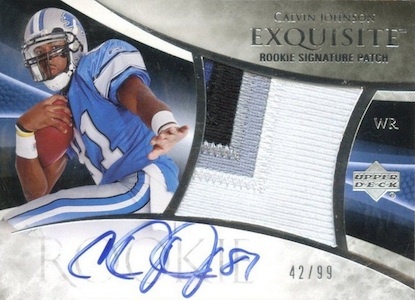 Although it is one of several Calvin Johnson autographed jersey rookie cards that are numbered to 99, 2007 Exquisite takes the top spot because of the brand recognition and appealing look. With an on-card autograph, medium jersey patch and limited print run, this is the top Calvin Johnson rookie card on many collecting lists. 2007 Premier Rare Remnants Quad Calvin Johnson, Ginn, Jarrett, Rice Jersey 3 5! 2007 TOPPS CHROME CALVIN JOHNSON RC BGS 10 PRISTINE! POP 1 1 HOLY GRAIL ROOKIE!